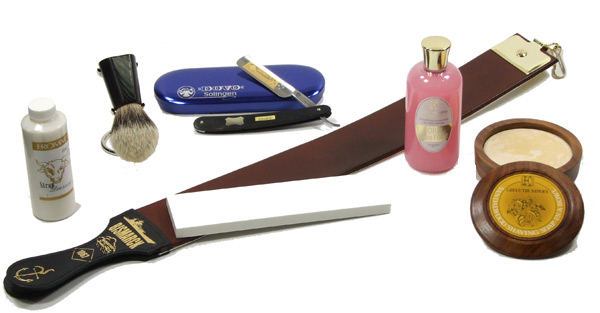 This Deluxe Dovo Straight Razor set contains everything you need for a lifetime of straight razor shaving. 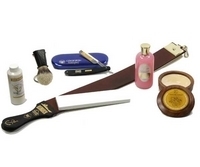 This kit has the finest straight razor supplies from Dovo of Germany and Trumper of England, even complimentary monogram engraving on the razor handle. If the man you know has "everything" then this is the gift for him! You can also choose your trumper soap scent : Sandalwood, Almond or Lime, if you do not select your choice we will send the most popular scent. - This extra fine stone will hone a blade to surgical standards. - Concord heavy duty, free standing, nickel plated shave brush stand. Made in Italy. - A century old traditional wood grain ebony micarta handle is reborn. This is the ultimate in the luxurious shave-judged to be the finest by those who know. Geo F Trumper Skin Food - A versatile requisite of the grooming ritual, skin food is ideal before or after the shave. As a pre-shave for sensitive skin, massaging Trumper's skin food against the growth of the beard lifts and softens the bristles in preparation. Its light non-oily glycerine based formula adds additional nourishment and protection to the skin, allowing the razor to glide with ease. By smoothing on Trumper's skin food after a shave, the new tender skin is soothed, sealed and offered nourishing relief.